Hey there! In the beginning of the month, we had our first snowfall of the fall season. With cold weather, I was off to making soups… the food I crave the most when the temperature dips below the freezing point. All told, I made three different soups in the Instant Pot within a week. The first two, I have already posted: a creamy (without the cream) simple Tomato Soup and a hearty and healthy Beef and Cabbage Soup. Check them out if you want! The last soup I tested that week was a simple chicken chili recipe that took a few tries before it ended up exactly the way I like it. It’s filling, comforting, delicious, and easy to make with fresh vegetables. 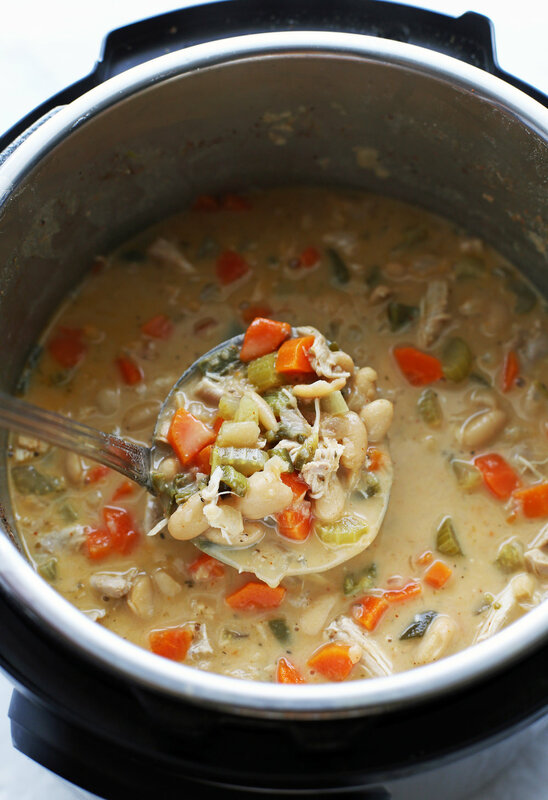 I hope you enjoy my take on Instant Pot White Bean Chicken Chili! How do you make this chili? Prep the vegetables for this chili. Full ingredient breakdown and instructions listed in the recipe card down below. This is an optional step: Mash a cup of white beans with liquid from the can in a bowl using a potato masher or fork. Check out the “Handy Tips” section of this post to find out why. Sauté the onions, peppers, salt, and pepper in the pot for 4-5 minutes. Then stir in the garlic for another minute. Add the remaining vegetables, beans, spices, and broth before giving it a stir. Place the chicken thighs on top. Seal and cook at high pressure for 8 minutes then natural release for another 8 minutes. Remove the chicken thighs from the pot and shred it into pieces using kitchen tongs or forks. Add the sour cream via a tempering process. Read the “handy tips” section of this post or check out the recipe card on how and why. Then stir back in the shredded chicken and squeeze fresh lime juice over top. Serve with toppings of your choice such as fresh parsley or cilantro, lime wedges, sour cream, and/or avocado. Enjoy! This is an optional first step. Take out a cup of white beans together with the liquid that it comes with from the can and then mash it all up using either a potato masher or a fork. The mashed beans and starchy liquid will add a little bit of creamy texture to the broth component of the chili. For spices, I kept it simple with chili powder and Italian seasoning. Two spice/herb blends that add delicious flavour to chili. Be aware that not all chili powders are made the same: some are quite hot while others are mild. Add according to your heat preferences. Speaking of heat, if you like it spicy, leave the jalapeño and poblano peppers’ seeds and ribs (the inner white pith) on. Place the chicken into the pot on top of the other ingredients, making sure it is covered with broth (as noted in Step 3 of the recipe). It's easier to take out for shredding. Make a count of how many chicken thighs you put in. That way you take out all the chicken to shred before putting it back. However, it’s not a big deal if you forget one. Don’t add the sour cream directly into the soup as it might curdle, which forms those unappealing bits of sour cream floating around that can’t be dissolved through whisking. Instead, use a tempering process. How to temper? Slowly add a small amount of the hot liquid to the cold ingredients. In this case, place the sour cream into a heat safe bowl and slowly whisk in a little bit of soup’s broth until combined. Then you add it back into the soup. Hearty and delicious: This is one filling chili full of tender shredded chicken thighs, fiber-rich white beans, and fresh veggies, which includes two types of peppers, carrots, onions, and celery. Perfect to have as an easy-to-make lunch or side dish. Easy to make: Once all the ingredients are prepared, this chili is made in the Instant Pot using two basic functions: "sauté" and "manual" (high) pressure. No complicated steps at all. Quick to clean-up: The vast majority of cooking is done in the Instant Pot so clean-up is a breeze. Great to have for leftovers: Just reheat up this chili the next day and it tastes just as good! Just note that as it cools, the chili will thicken so you may want to add some additional broth in when re-heating. Looking for more Chicken Instant Pot recipes? Measure out one cup of beans with liquid, place in a small bowl, and mash until creamy *(see first note). Drain and rinse the remaining beans under cold water. Set aside. Set the Instant Pot to "sauté." Add the olive oil, onions, peppers, salt, and pepper to the pot, stirring until softened, about 4-5 minutes. Then add in the garlic and stir for another minute. Press "cancel" to turn off the Instant Pot. Add in carrots, celery, beans (whole and mashed), chili powder, Italian seasoning and broth to the pot, giving the ingredients a good stir to distribute the ingredients. Place the chicken thighs on top (make sure it is completely covered in broth). Seal the Instant Pot and cook at high pressure (“manual”/"pressure cook" function) for 8 minutes. After the soup is ready, allow natural pressure release for 8 minutes before applying a quick pressure release to completely depressurize (until floating valve drops). Open the Instant Pot and carefully remove (I use kitchen tongs) the chicken from the soup. Shred the chicken using the tongs (or with forks) into small pieces. Place sour cream into a heat safe bowl and then whisk in a cup of liquid from the soup until the sour cream is completely incorporated into the liquid **(see second note). Return the shredded chicken and sour cream mixture to the soup, giving the soup a stir. Finish with lime juice. Taste for additional salt and pepper (or other seasonings). Scoop the soup into bowls and top with additional toppings if you like. Best served hot. *Mashing the beans is optional, but it helps thicken the soup. **This process (tempering) helps prevent the sour cream from curdling in the soup. The soup will continue to thicken as it cools. Nutritional information represents one serving with eight servings in total.